Hockney is an artist whom it never occurs to me to list as one of my favourites, and yet each time I find myself in one of his exhibitions, I find myself inspired in new and different ways. It also seems that his exhibitions provide markers for my artistic journey - an exhibition I visited in my teens became what I think of as my first positive gallery experience, having always considered museums and galleries tedious before that. Last week I went to the Hockney Printmaker exhibition at Dulwich Picture Gallery. Of course, it made me want to take up etching and lithography, printing forms so technical that I've never been tempted to acquaint myself with them. I loved the abstract narrative and mix with text of Hockney's early prints as a student, including this one from the Rake's Progress. 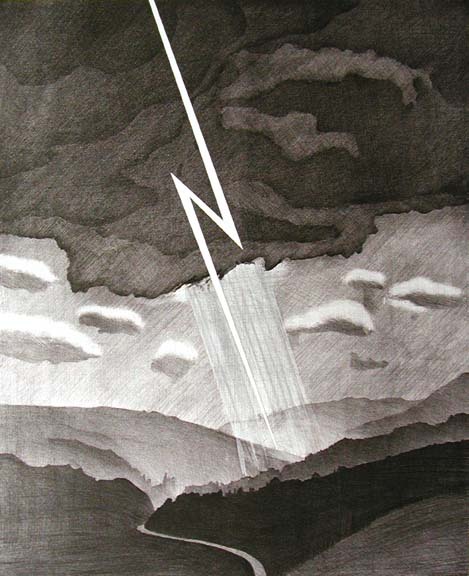 And it's completely different to what I expect of Hockney but I really enjoyed his 'Weather Series' - this one, Lightning, in paticular, along with Wind and Rain. Not the sunny days for me! !